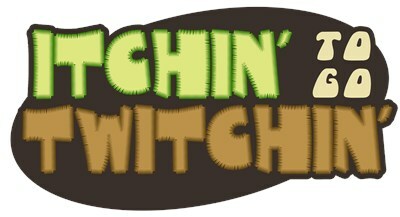 This funny design done in a scratchy-looking font reads "Itchin' To Go Twitchin'." Done in muted shades of brown, tan and green. This is a good one for the next time you're craving a good twitch -- wait, that's every day, right? A fun gift idea for your twitch-crazy birding buddies. You know the one(s). To order by phone, call toll-free at 1-877-809-1659 from Monday - Saturday 9:00am - 9:00pm EST. You'll need to note the Product Number 030-1264337022 to make your order.